Organ Pipe National Monument ranks among the most spectacular treasures within the US National Park system and is recognized as a component of an International Biosphere Reserve that includes adjacent areas of northwestern Mexico. There are three kinds of giant columnar cacti, colorful and fantastically rugged mountains and desert solitude for everyone. Add to that some of the most spectacular sunsets anywhere. 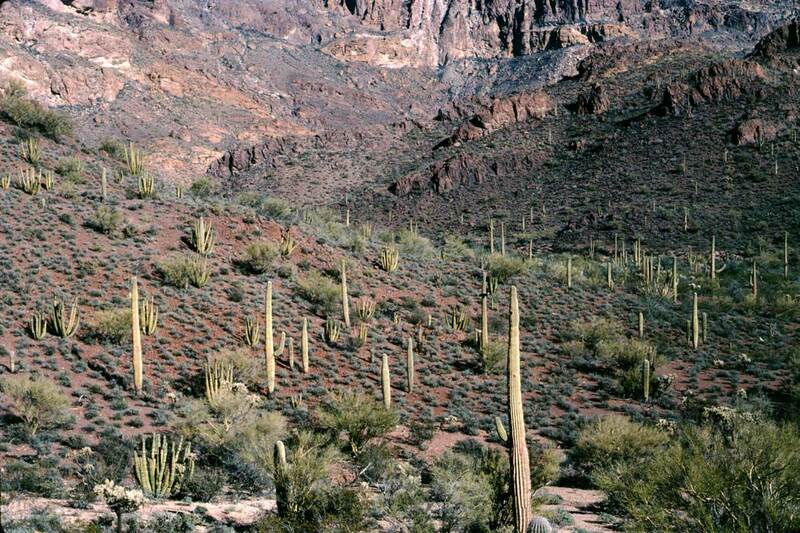 Organ Pipe N.P. is located on the US-Mexico border some 140 miles south of Phoenix or 130 miles west of Tucson, Arizona making it a considerable drive from more well traveled routes. This is a huge park stretching more than 35 km from north to south and more than 40 km east to west at its widest. In addition there are many other worthy destinations in the vicinity: First and foremost are the International Biosphere units across the border in Mexico (Pinacate, Gran Desierto and vast estuaries at the northern end of the Sea of Cortez). 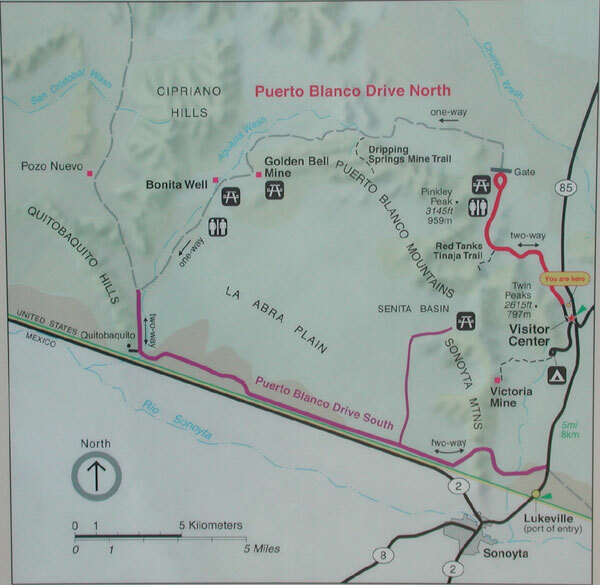 Then Cabeza Prieta National Wildlife Refuge and the Camino de Diablo to the west of Organ Pipe run along the US side of the border adjacent to Gran Desierto. Kitt Peak with its astronomical observatories sets about 80 miles east towards Tucson. What this really all means is that the visitor can spend many days if not weeks exploring the area, or like myself, will be drawn to return again and again. The camp ground ("Twin Peaks") and visitor's center are great starting points for your adventure. The park entrance fee is $8 and camp fee $12 - restrooms with water but no showers. Many of the most characteristic birds, animals, cacti and shrubs flourish within the camping area. Somehow the animals just know that visitors pose no threat and so they come up close making for easy observation. The 'must' visit locations within Organ Pipe are Senita Basin the only place to see Senita Cactus and Elephant Trees, Estes Canyon and trail to Bull Pasture, Ajo Mountain Drive, Arch Canyon and Alamo Canyon. Check the National Park Service website to get more travel info and planning tips. The town of Ajo lies 30 miles to the north where there are guest houses and plenty of lodging. RV parks with more substantial creature comfort facilities are available in Why and Lukeville just outside the park boundaries. A Pacific front blew through the Sonoran Desert and cool (relatively) weather was predicted to hold sway for a few days. The Twin Peaks campground was nearly deserted as was most of the park, yet the temps were very comfortable. There were no bugs and I slept so comfortably under the stars. The sky's overnight were crystal clear allowing for maximum star viewing and by dawn the temperature was a very pleasant 9°C. During summer the most productive time to explore the desert is at the crack of dawn, late in the evening, or even at night. Desert animals and many flowers avoid the intense heat by restricting their activities to these cooler periods. A head mounted flashlight will be desirable for night explorations. As it turned out the temps were too cool for snake activity overnight. The most disturbing activity were the hordes of Border Patrol agents riding in gas-guzzling SUV's and zipping overhead in even more fuel hungry helicopters -- b.t.w. I didn't seen any aliens but I'm sure we owe some for the burnt oil. All of the typical desert birds and mammals were present at the campground and frequently came in close to my breakfast table for a hand out. The campground pathways provide ready viewing/photography of the desert cacti, shrubs. Both saguaros and organ pipes had open blooms. Engelmann Prickly Pear, Velvet Mesquite, Foothill Palo Verde, Trixis, Ironwood, Catclaw, Canyon Ragweed and Eriogonum also had open flowers. I watched a Harris' Squirrel use an ocotillo as a highway to the top of a saguaro where it feasted on developing fruit. Normally these squirrels can't climb up to these treats. Sangre de Drago (Jatropha cuneata) is a unique shrub to this part of the Sonoran Desert and several can be found growing within the campground area. Common birds in general order of Abundance. A complete list is available at the park visitor center. 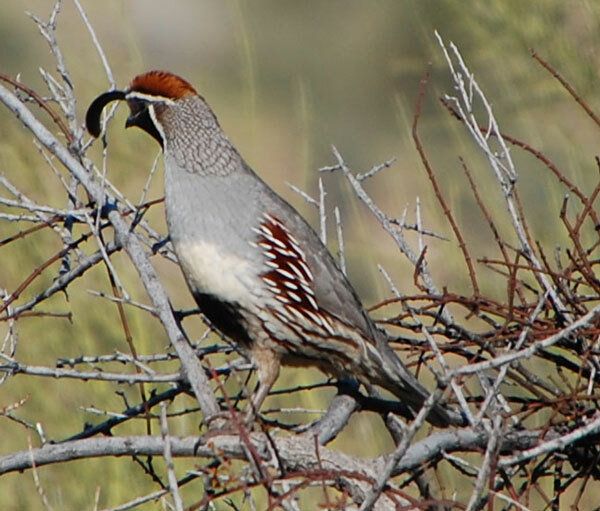 Gambel's Quail carries a distinctive feather atop its head. 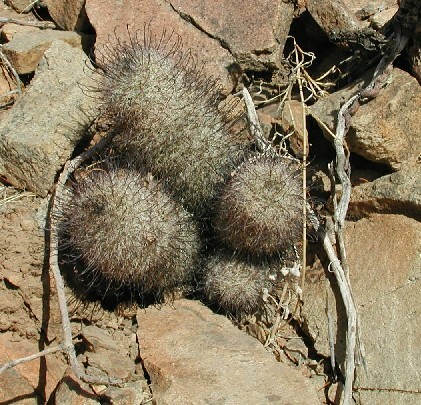 Teddy Bear Cholla (Opuntia bigelovii) -- might be confused with the O. fulgida but lacks the chained fruits. Mammillaria cactus are quite variable and a number of purported varieties have been named..